PLEASE BE SURE TO WAIT FOR INVOICE BEFORE PAYING FOR ITEM. BEING OFFERED IS THE SECOND OF TWO SPECTACULAR, RARE, AND MUCH HARDER TO FIND, SIGNED AURENE.... # 2642, TALL CHALICE COMPOTE BLUE AURENE ART GLASS VASES, IN EXCELLENT - MINT AGED CONDITION (PLEASE VIEW MY PHOTO'S). 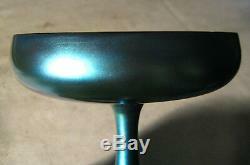 IT IS A PREMIUM QUALITY EXAMPLE OF FREDRICK CARDER STEUBENS BEST BLUE AURENE!! IT IS INCREDIBLY THICK, SOLID, STRONG, HEAVY, CLEAN, WELL BALANCED, AND WELL MADE!! IT RINGS NICELY WHEN TAPPED WITH MY FINGER!! 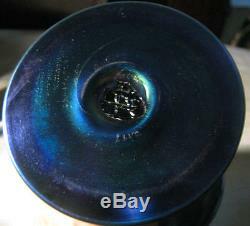 IT HAS TRULY STUNNING, DEEP RICH BLUE AURENE ART GLASS COLOR TO IT!! IT HAS NO CHIPS, CRACKS, HAIRLINES, REPAIRS, OR DAMAGE!! IT IS A JOY JUST TO HOLD AND FEEL!! IT IS PROPERLY SIGNED AS SHOWN. 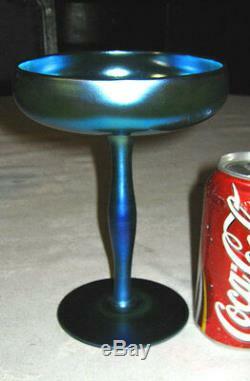 IT MEASURES A WONDERFUL ART GLASS DISPLAY SIZE: 7 1/8 " HIGH, X 5 1/8 " WIDE (ACROSS THE TOP), X 3 7/8 WIDE (ACROSS THE BASE). 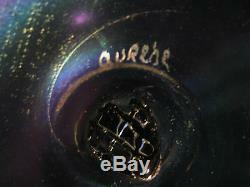 IT IS PERHAPS THE FINEST EXAMPLE OF STEUBENS BLUE AURENE THAT I HAVE EVER FOUND!! IT IS INVESTMENT QUALITY STEUBEN AND WILL CONTINUE TO APPRECIATE IN VALUE!! THEY COMPLIMENT EACH OTHER NICELY!! 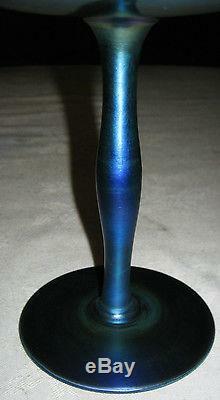 THIS VERY LOVELY STEUBEN TALL CHALICE COMPOTE BLUE AURENE ART GLASS VASE HAS GREAT ATTENTION TO FINE ARTISTIC DETAILING TO IT AS SHOWN!! IT IS TRULY A ROOM STUNNER!! IT HAS NOT BEEN WASHED, CLEANED, OR WAXED. Please View My Other Auctions, Thank You! Thank You for viewing and Have a Wonderful Day! 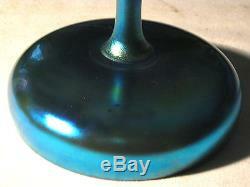 The item "# 2 ANTIQUE STEUBEN BLUE AURENE CHALICE COMPOTE BOWL ART GLASS DISH VASE # 2642" is in sale since Thursday, October 10, 2013. This item is in the category "Pottery & Glass\Glass\Art Glass\North American\Steuben".